The following audio examples were recorded with drummer Ant Fox in the Colin Hill Recital Room at Cambridge's Hills Road Sixth Form College. 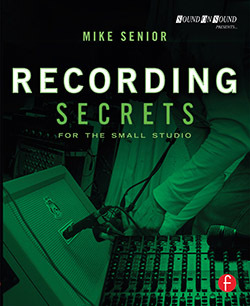 The instrument was captured with AKG D112 cardioid dynamic mics and Neumann U47 large-diaphragm supercardioid condenser mics (kindly loaned by UK equipment rental company FX Rentals) which were preamplified via the mic preamps of a Tascam DM3200 digital mixer and recorded digitally without any signal processing. Many thanks to the college's Director of Music, Jonathan Sanders, for the use of the recital room and its adjoining control room, and also to Geoff Smith, Dan Jeffries and Tom Adams for their assistance with the sessions. This microphone setup used five AKG D112 microphones to capture 15 different mic positions within the kick drum. Four other microphones were also recorded alongside to provide more real-world context: a pair of Shure KSM141 small-diaphragm condenser microphones set up as overheads, so that you can hear how the close-mic signals relate to the sound of the whole kit in the room; and two Neumann U47 FET large-diaphragm supercardioid condenser microphones outside the drum, so that you can evaluate how each of the D112 signals works in commonly used 'inside+outside' multimiking scenarios. 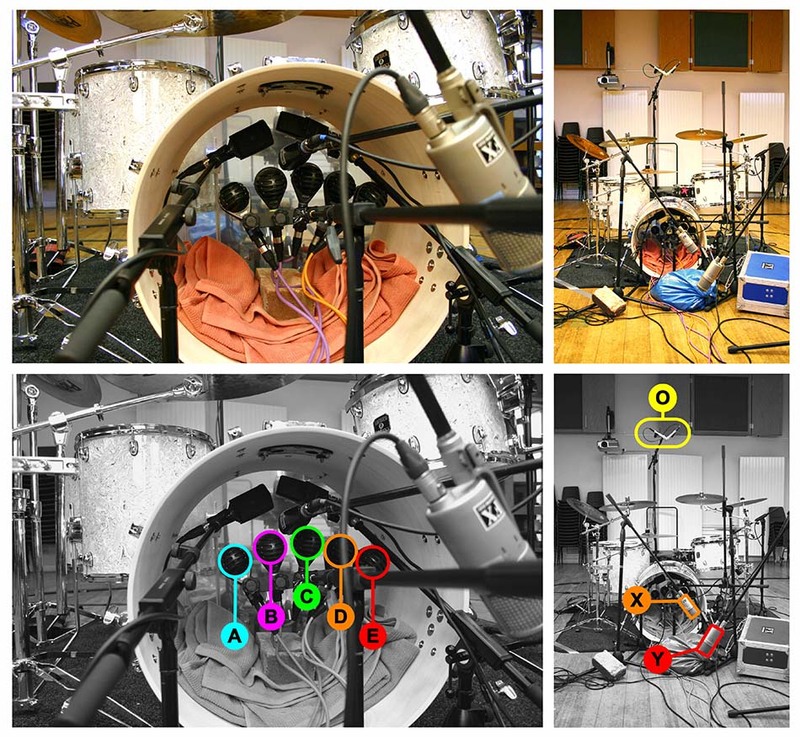 Inside The Drum: These audio examples feature six separate recording passes in total. First the instrument's resonant head was removed, and three passes were carried out with the horizontal row of D112s at different distances from the batter head. Then a resonant head (with five-inch-diameter mic-access hole) was fitted to the drum and the five D112s were recorded again from the same three miking distances. This microphone setup used five AKG D112 close microphones on a drum with a full resonant head fitted. As in Multimic Setup 1, four additional microphones were recorded alongside for context: a pair of Shure KSM141 small-diaphragm condenser microphones set up as overheads (as shown in the Multimic Setup 1 diagram), and two Neumann U47 FET large-diaphragm supercardioid condenser microphones further away from the drum. In addition, I've also included signals from a Sennheiser MD421 cardioid dynamic mic and a Neumann KM84 small-diaphragm cardioid condenser mic which were set up on the drum's batter-head side, so that you can evaluate the sound of each D112 signal within commonly used 'front+back' multimiking scenarios. Outside The Drum: For these audio examples the five D112s were all pointing directly at the drum's resonant head from a distance of 10cm. This microphone setup used five AKG D112 microphones on a kick drum fitted with a resonant head (featuring a five-inch-diameter mic-access hole). An additional stereo pair of Shure KSM141 small-diaphragm condenser microphones were also set up as overheads (as shown in the Multimic Setup 1 diagram) and recorded alongside the D112s for context. Three separate recording passes were recorded: one pass without any acoustic baffling of the D112s; a second pass with the D112s shielded from spill by a 'tunnel' built out of four kick-drum shells gaffer-taped together (left picture below); and a third pass with the D112s shielded from spill by a thick layer of drapes, duvets, foam sheets, and carpets, all supported on an improvised frame constructed from four spare mic stands gaffer-taped together. Miking-distance & Acoustic-baffling Comparisons: These files demonstrate how frontal miking distance affects the sound of a kick-drum mic, and how two well-known acoustic-baffling techniques affect both the spill pickup and the sound of the kick drum itself. To read more about recording kick drum, check out this Sound On Sound magazine article, to which the above audio examples directly relate. 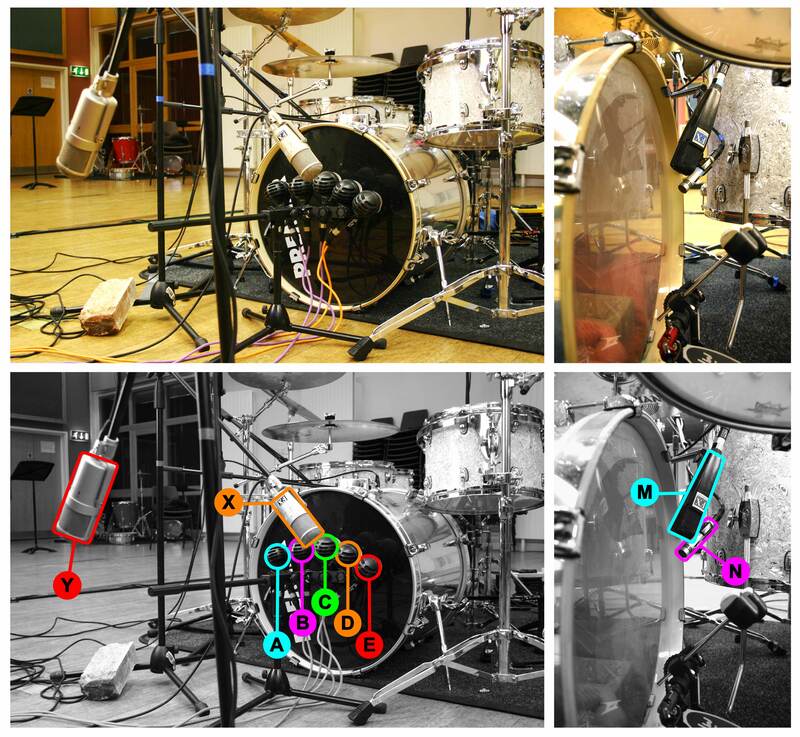 You can also hear the additional microphones shown in some of the pictures above, as well as a shootout of a number of famous kick-drum recording microphones.